We all marvel at the life teeming on sunny reefs. Well, it turns out that the deepest portions of our oceans, those inky-black abyssal regions, where sunlight will never penetrate, where plants cannot grow, where the human body would implode from the pressure, where once scientists thought that life could not exist, are actually home to more abundance and variety of life than those sunny reefs. And we've only explored 1 millionth of those depths. So much to learn about our own planet. Just a little dose of humility. Thanks for the article, Susanna. I, for one, am totally terrified of the things that do, might and can live in those abysses. Yes, so much to learn about our own planet. We should drop the idea of spending billions on a manned mission to Mars, where we're unlikely to find much more than rocks. We're already here, let's explore and learn here. These always remind me of the game Banjo Tooie when you have to go into Davy Jones' Locker and battle one. 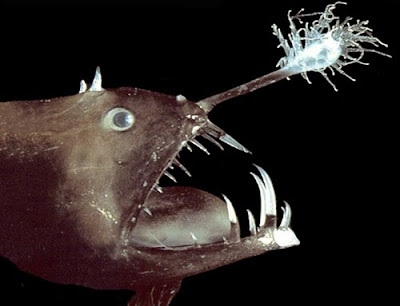 And trust me, the fish in the game is just as ugly....and horrible. It's so hard to kill!